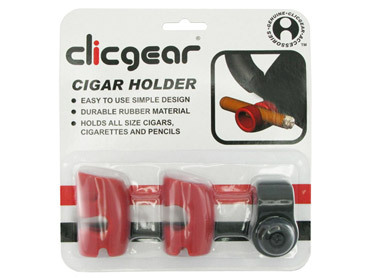 The Clicgear® Cigar Holder easily clips to your cart for cigar, cigarette or pencil storage. 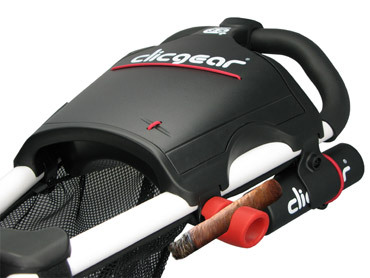 The Clicgear® Cigar Holder easily holds lots of items. Made from durable rubber material and is very easy to use. Grips multiple sizes of cigars with the Extra Large, Medium and Small Size holders included. This accessory fits all Clicgear Model 1.0, Model 2.0, Model 3.0, Model 3.5 Plus and Rovic® Carts. It will also fit other brand name push carts with 1" tubing. This product is supplied with (x1) Clicgear Accessory Tab mount for easy installation. Clicgear does not suggest you smoke!